Keep an eye on this blog, because Sharon has generously agreed to give away a set of codes for free copies of the audiobooks here. Audiobooks are not exactly cheap compared to other editions, so if you’re into audio at all, I bet you might well appreciate an audio giveaway! This giveaway will take place within the month, but please be patient because it won’t be tomorrow. The link above takes you to Amazon, where if you wish, you can read the back cover description. But you might not want to read that, because I personally thoroughly enjoyed being surprised by some events that are pretty well revealed in that description. Up to you, of course. I’m just saying. For me, audio is a tough format. Listening to an audio book is much slower than reading text, and the slowdown exacerbates any kind of problem with the writing. Awkward sentences or iffy plot points can’t hide in forward progress because there’s no way to skim across them. A scene that might be paced fast enough in text slooooooows down to an absolutely glacial rate of progress in audio. In general, a book I might have liked pretty well in print is kind of meh in audio, and a book I might have liked enough to finish in print moves into the DNF category in audio. There are two authors who work really well for me in audio: Terry Pratchett and Georgette Heyer. The writing is so good, plus there are enough plot twists and humor to keep my attention engaged for long periods during, say, a five-hour drive to a dog show. 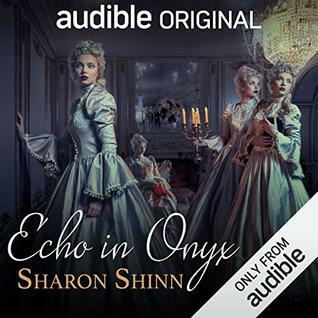 For me, Echo in Onyx worked just as well in audio as a novel by either of those authors – the first audiobook by anybody else to jump up into that category. It’s the first audiobook I have ever listened to while doing nothing in particular — just sitting around, listening to it. I almost always need something else to do with my hands and eyes while listening to an audiobook, but this time I listened to several hours’ worth while just sitting on the couch. The world in this trilogy is almost free of magic, except for the echoes. It’s not really Regency, but is strongly Regency-flavored, so it’s going to feel familiar to the reader. Except for the echoes. Imagine what it would be like to have two or three or four near-identical copies of you following you about every moment and echoing your every move and pose and gesture. Imagine what it would be like, watching aristocrats go about their lives in triplicate. Echoes don’t speak and are generally thought to have no real separate identities or thoughts; they are just physical echoes of their originals. For some time I was all, WHY? Why does this happen and how come aristocrats consider it desirable to have echoes anyway? This is eventually explained in a way that makes reasonable sense and even ties into the metaphysics of the world. So that’s the world: Regenty-ish, with echoes. Now, Brianna, the protagonist, has had such a nice, smooth, happy childhood. She certainly has never faced a big challenge. When she moves to the city, she quite easily lands a plum job as lady’s maid to Lady Marguerite, the governor’s daughter, who is kind, sensitive, lonely, and quite willing to treat her maid pretty much as a friend, so Brianna’s life seems set to continue on its nice, smooth, happy path forever. Marguerite, by the way, has three echoes. And a secret. Then Marguerite, along with various other eligible young ladies, is invited to the capital in a sort of reality-show situation – the heir to the throne is expected to choose a bride. The decision will be complicated by political maneuvering behind the scenes, but neither Brianna nor the reader is all that aware of (or interested in) those machinations. The story remains tightly focused on the human relationships – principally Brianna’s relationship with Marguerite and Brianna’s relationship with Nico – a servant of the crown whom she meets rather early in the story and who will play an important role as the story moves forward. Perhaps it may seem fraught if I mention that Nico is an inquisitor; like a cross between a detective and a secret policeman. a) Driving to St Louis last weekend, I exclaimed aloud as I encountered a really important plot twist. I will say, this was not exactly unforeseeable. But I did not foresee it. I emailed Sharon at that point and told her she practically made me have a car accident, which was figuratively if not literally true. b) On Monday, while walking the dogs, I came to a complete halt in astonishment and alarm. This was at the moment Brianna stood up during dinner, in case you listen to or eventually read the book and want to know. c) Yesterday, I arrived at work at the exact moment Nico discovered the truth about, um, things. That was not a great spot to have to pause the audiobook for the day. d) You should totally give this book a listen if you like audio at all — especially if you already know you like Sharon Shinn’s books. a) The beginning may seem slow. It is slow, in fact. The giant problem that will drive the story does not occur for some time – say, around the early middle. This did not bother me despite how painfully slow some audiobooks can seem. Just as Georgette Heyer could somehow start False Colours with an eighty-minute conversation where the mother explains her improvidence to her son Kit without boring the reader, so Sharon Shinn manages to lead the reader through the warm, comfortable, easy beginning of Echoes in Onyx without boring the reader. Or at least, without boring me. Still, the story is objectively slow to start. b) A worldbuilding detail mentioned early on may strike the reader as potentially very important. An astute reader may well say to herself, Hmmm, I wonder if maybe this might be really useful in getting someone out of a seriously tight corner into which she might be painted. Yes, yes it is. So this particular aspect of the resolution is predictable, especially since anyone who has read many of Shinn’s books will know perfectly well the story is not going to end as a tragedy. I guess if this were your first-ever story of hers, you might be in some doubt, but no way. Of course, the details of the resolution are a lot less predictable, but the ending is mostly not fun because it’s surprising; it’s fun because the reader gets to watch the bad guys be thwarted. One final note: This story ties up perfectly and completely – it had to, because the protagonist and surrounding characters are going to change with the next book. There is a hook for the next book right at the end, but it doesn’t count as a cliffhanger. Nothing useful to say about the book, except my interest is certainly piqued, but — are there a lot of audio-first releases out there, and I just haven’t noticed because I’m not on Audible? “Audible First” is a relatively newish publication mode by which you publish exclusively with Audible for some period of time and then are able to bring out print and ebook editions shortly thereafter. I remember Caitlin looked into the possibility for something or other of mine a couple of years ago, but we went a different direction in the end. But I do expect there are probably a fair number of books brought out that way these days, because audio is growing so fast as a piece of the publishing pie. Wait, what? Audible first? No initial print edition? Wow, that would never even have occurred to me.